Despite the fact that the Russian capital is recognized as one of the most expensive cities in the world, people in the know will always find a cheap place where they will be able to have a meal. If you walk around the center, the air smells of food, and you only have 200 rubles in your pocket, this article is for you. The word "sandwich" did not exist in Russia for a long time. Russian sandwiches were called “buterbrod”: having eaten a sandwich of bread with a piece of “doktorskaya” sausage or with butter and salt, you can safely assume that you have tried the Russian national dish. In the sandwich café Buterbro, which opened one year ago, the best sandwiches in town are served. Young guys from the Buterbro team bake their own bread, prepare smoked ham and cod, salted salmon, cook wonderful soups and do not get tired of pleasing Muscovites with the best sandwiches at attractive prices. Here puff pastry is cooked. This is a spherical analogue to sandwiches with vanilla, chocolate, chicken curry, pork or capers, vegetarian, meat, fish, salted or sweet - in short, for every taste, it is enough to just love the airy dough and not be afraid of eating pastry. At the "Enthusiast" they will give you a delicious meal and at the same time they will repair your Harley. If you do not have one, you will at least be allowed to see how they fix someone else’s or they will offer to you an antique mirror for the bike. "Enthusiast" unites biker culture followers, lovers of cheap and delicious food, beer fans and antiques hunters. In addition, there is a radiocircle gathered here, in the evenings you can have a good time dancing, and at dinner you can see an interesting movie. The availability of noodle cafes which serve Asian food right is a distinctive feature of any metropolis, be it New York, London or Moscow. In Moscow, there are three places worth seeing for a real gourmet lover. 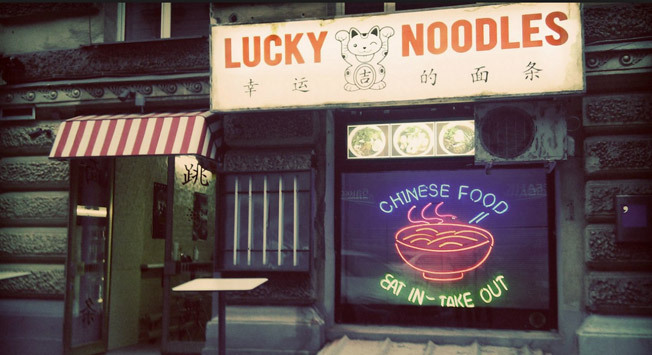 Chinese noodles with chicken, shrimp or beef, beer, Tsingtao, AriZona tea, Dim sums – the menu of Moscow noodle cafes will make all the lovers of Asian cuisine feel "at home". The best, and perhaps the only place for falafel and Sabih shakshuha that are cooked in an authentic style and are served in the new Moscow falafel cafe The Hummus. The Hummus has a free delivery service in the city, so you can order your favorite meal, without getting up. 7. " Ludi kak Ludi"
This legendary café, which serves cheap, tasty and healthy food, has become famous throughout Moscow’s student community (former students included). Ask any student and they will know the ingredients of the popular ‘Number 5 cocktail’ (cranberries, black currants, cherry juice). Indulging in the delicious salmon, spinach and feta cheese pie (a big piece for 3 euros) and chatting to the warm and friendly bar staff has become something of a ritual, followed by a cigarette under a tin canopy outside listening to the sound of water dripping down from the broken air conditioner. Ludi kak Ludi is a very small and cozy cafe with 6-7 tables, which seats 4 times more people than was originally intended. In a very small room that was used as a dressing room of a Moscow club, The Burger Brothers furnished the kitchen and began to sell takeaway food – from the window leading into the alley. At first on the menu were only soft drinks and burgers: The all American Burger (with American sauce, fresh red onion and tomato), Ginger Burger (a beef patty, ginger and tomato sauce, onion rings and spinach) and Cheddar Burger (with cheddar cheese and red onion marmalade). The BB later began to prepare soups (with mint, young green peas and cream, tomato with lime and cilantro). All burgers are served with fries (a double size can be purchased for an additional amount of money), each one costs 300 rubles ($ 10). The HUB has a reassuringly short menu: four sandwiches, a few salads, delicious coffee, and tea for 2 euros for a big pot, a couple of decent beers and Magners cider. The HUB "catches" visitors with their huge sandwiches, served with a micro-bucket of baked potatoes with cheese. All are made with a ciabatta base and contain generous portions of all that has to be in it. The "super-rich HUBburger" 200-gram patty (350 rubles or $12) is waiting for burger lovers. For lovers of poultry there is a sandwich with chicken, pineapple and curry (300 rubles or $10). All lovers of cakes, croissants and other delicate pastries leave Karavaevs completely happy – in fact, a delicious espresso here costs only 60 rubles, and, for example, a Norwegian salmon sandwich costs 125 rubles ($4). From a low-key bakery – Pirozhki café, the "Brothers Karavaev" culinary shops network has grown to 13 branches in five years and has evolved into one of the most innovative café networks in the capital’s market. Office clerks have got into the habit of popping in here at lunchtime and housewives love shopping for pastries and desserts here. Pel’meshka is a small fast-food chain with incredibly tasty homemade dumplings. Dumplings are little meat balls wrapped in dough, the Russian equivalent of the Italian ravioli. They are served here for 250 rubles ($ 8) per serving. It is worth noting that dumplings are considered traditional Russian food, and they should definitely be tried during your trip to Moscow. 12. Cafe and club "Propaganda"
The Legendary café "Propaganda", where the soles of more than one generation of fans partying the night away have been worn out, is still thriving. During the day you can eat fresh homemade pappardelle, sandwiches on focaccia bread, and (beef) steaks. In the evening, you can go dancing. On Sundays, the gay parties are still the main ones in the city.